The European Meteorological Society has chosen Michel Jarraud as Laureate of the EMS Silver Medal 2016. He is honoured for significant scientific contributions to the establishment of spectral methods in numerical weather prediction, his leading role in developing the World Meteorological Organization into the recognized authority about weather, climate and water within the United Nations system, and his part in the development of several major initiatives, in particular the launching of the Global Framework for Climate Services. The Silver Medal ceremony, which includes a Silver Medal Lecture by the Laureate, will be held on Tuesday, 13 September 2016, during the EMS Annual Meeting and European Conference on Applied Climatology (ECAC) in Trieste, Italy. 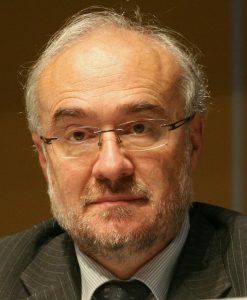 Michel Jarraud undoubtedly made outstanding contributions in support of the worldwide meteorological community and beyond: His capabilities and achievements, ranging from science to management and successfully combining them, were instrumental for the introduction of modern forecasting methods at Météo-France and ECMWF. He had leading roles in Météo-France, ECMWF and above all in WMO and made significant scientific contributions to the establishment of spectral methods in numerical weather prediction. He developed the World Meteorological Organization into the recognized authority on weather, climate and water within the United Nations system and he was instrumental in the development of several major initiatives, in particular the launching of the Global Framework for Climate Services. Michel Jarraud is an outstanding researcher and internationally recognized expert in spectral methods. His work in the early days of ECMWF was instrumental in the selection of this method for the ECMWF model. As director of forecasting at Météo-France and as Head of Operations at ECMWF he focused his attention on reinforcing the links between the research and operation departments, in order to ensure a smooth and efficient transfer of research developments into the operational forecasting system. His utmost legacy will be the accomplishment to turn WMO into the reference UN institution not only concerned with weather, but in addition also with hydrology and climate, which culminated in the establishment of the Global Framework for Climate Services (GFCS). As WMO Secretary General he has immensely contributed to strengthening the effectiveness of UN voices in water, disasters and climate issues. Michel Jarraud’s career. In 1974 Michel Jarraud graduated from Ecole Polytechnique in Paris with the degree “Ingénieur de l’Ecole Polytechnique” and in 1976 from Ecole de la Météorologie Nationale in Paris, with the final degree of “Ingénieur de la Météorologie”. From September 1976 to May 1978 he worked as a Researcher in Numerical Weather Predictions at Météo-France. In June 1978 he joined the European Centre for Medium-range Weather Forecast (ECMWF) where he played a major role in the development of the ECMWF operational spectral numerical model. 1985 Michel Jarraud became Director of the national forecasting division at Météo-France. He re-joined ECMWF in 1990 as Head of Operations Department and since 1991 as Deputy Director. 1995-2003 WMO representative at UN Inter-Agency Task Force for the International Strategy for Disaster Reduction (ISDR). EMS Silver Medal. The EMS Silver Medal was established in 2008 to honour important contributions to the development of meteorology in Europe. The Award is presented annually. Candidates for the EMS Silver Medal are nominated by Member Societies and Associate Members of the EMS. The EMS Awards Committee, consisting of senior members of meteorological institutions in Europe, makes recommendations to the EMS Council for a final decision. Previous recipients were the late Karin Labitzke (Germany), René Morin (France), Lennart Bengtsson (Sweden/Germany), David Burridge (United Kingdom), the late Jean-François Geleyn (France/Czech Republic), Tim Palmer (United Kingdom), Hartmut Graßl (Germany), Peter Lynch (Ireland) and Anton Eliassen (Norway). Global Framework for Climate Services (GFCS). http://www.gfcs-climate.org/ GFCS provides a worldwide mechanism for coordinated actions to enhance the quality, quantity and application of climate services. WMO. www.wmo.int World Meteorological Organization is a specialised agency of the United Nations System with 191 Members, responsible for meteorology, climate, operational hydrology and related geosciences. WMO is based in Geneva, Switzerland. ECMWF. www.ecmwf.int The European Centre for Medium-Range Weather Forecasts is an independent intergovernmental organisation supported by 34 states. ECMWF is both a research institute and a 24/7 operational service, producing and disseminating numerical weather predictions to its Member States. ECMWF was established in 1975 and now employs around 300 staff from more than 30 countries. ECMWF is based in Reading, UK. Météo-France. france.meteofrance.com/ Météo-France is the French national weather and climate service. Its main mission is to ensure the safety and protection of the population and the infrastructure. It has the responsibility of observing weather and climate over the country and forecasting the evolution of the atmosphere, of the snow and the surface oceanic characteristics.